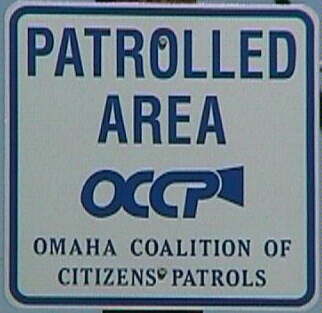 Welcome to the Omaha Coalition of Citizens Patrols Home Page. can be a source of information. throughout Omaha and the surrounding area. their time in 1998 to make Omaha a safer place to live. Omaha Metropolitan area to contact E-Mail us at dcholmessr@hotmail.com . Generally, patrols are started as a response to increased criminal activity in a given area. and send the message that crime and inappropriate activity will not be tolerated in this area. Typically, citizens patrol their neighborhood at night and especially on weekend nights. confront verbally or physically, and they understand that they will not attempt to arrest anyone. OCCP is not affiliated with any agency, private or governmental.